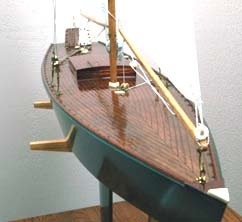 The largest of the models sailed by RCMSC members, this 37 inch long wood hull sloop sports a 45 inch mast with 635.5 total square inches of sail area (mainsail is 391.1 square inches and jib sail is 244 square inches). A 7 inch beam gives her a sleek profile; and a shallow keel-fin depth of 11.5 inches allows her to be launched at shoreline. A finished weight of just under 5 pounds and a removable mast make her easy to transport. A 2-channel radio controls both sails and rudder. One of the few all wood sailboats to be sanctioned by the AMYA, the T37 is unique for its lack of internal framing or bulkheads. The 1/8 inch mahogany hull sides, bottom and deck are instead joined using a West System epoxy that results in a light, strong composite boat. 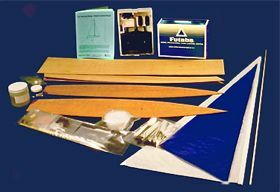 Available in kit form (see kit package pictured below) or as a sail-ready model, the T37 comes complete with electronics, sails of nylon spinnaker cloth, solid brass or marine grade stainless steal fittings, and lead ballast. Builders need only supply batteries and paint or varnish. A racing upgrade is available for both the kit and assembled model. Included in the upgrade are a double throw sheeting system, CF booms, boom-vang system, and ultra torque HS-645 metal gear sail servo. Designed and manufactured by Will Lesh at Tippecanoe Boats in Everson, WA (US), the T37 is a one-design class that allows few variations. The T37 must be assembled using manufacturer’s parts and building instructions, including the choice and placement of electronics. Some discretion is allowed in rigging, rudder configuration, and hull finish. And it is in the finishing that T37 builders may display both craftsmanship and originality. With the silhouette of a classic wooden yacht, the T37 invites a high gloss finish (varnish or paint), raised cabin structure and marine brass bits. Photos of completed models may be found in our T37 Gallery and at the Tippecanoe Boats website. Text of the T37 design rules are available at the AMYA T37 Class Page. Roughly 2000 T37 models are now sailed worldwide. No surprise, the largest contingent of T37 sailors is found in the Pacific Northwest, providing RCMSC members with the opportunity to join other T37 skippers at more than a dozen venues in Oregon and Washington. Several AMYA sanctioned model sailing clubs in the area host T37 regattas, and welcome nonmember participants for a single event fee. See the website of the Pacific Northwest Model Yacht Club for information about venues and model yacht clubs that sail the T37 in the Pacific Northwest. The US T37 Registrar is Will Lesh. Contact Will through the AMYA T37 Class Page or the Tippecanoe Boats website. Useful tips from knowledgeable T37 builders / sailors are offered at two online forums (registration is required to post comments): the Pacific Northwest Model Yacht Club Group on Yahoo, and the RC Groups Sailboats Forum: Tippecanoe Boats Thread. T37 designer Will Lesh has posted a detailed photo build log at the Tippecanoe Boats website. Included there is a link to a second photo build log by RCMSC member Ted Naemura. See our LINKS Page for additional online T37 building and sailing resources.